Natures Menu Country Hunter Turkey Dog Food Pouches will be your dogs favourite food! This award winning range of convenient, complete and balanced meals are naturally nourishing, easily digested and made with ethically sourced human grade meat and wholesome ingredients. Containing 80% farm reared turkey and wholesome fruit and vegetables, Country Hunter dog pouches are lightly steamed to lock in all their goodness. Packed with a single source of protein, scrumptious fruit and veg and natural vitamins and minerals. What’s more, Country Hunter dog pouches are grain and gluten free, and are free from artificial colours and flavourings too. •	Grain and Gluten Free. •	Suitable for dogs aged 1-7. 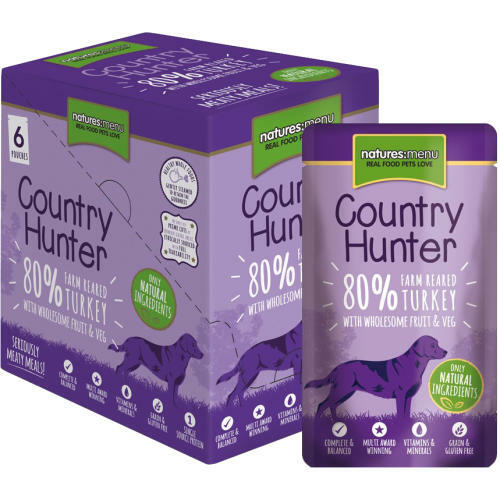 •	Nourish your dog naturally with tasty Natures Menu Country Hunter Turkey Pouches. Turkey (min 80%), Sweet Potato (3%), Carrots (3%), Green Beans (3%), Mixed Berries (2%), St Johns Wort (0.5%), Spirulina (0.5%), Yucca Extract, Green Tea Extract, Grape Seed Extract, Rosemary Extract.